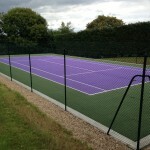 The macadam court dimensions will vary for each different sports facility, there are no right or wrong dimensions, however if the sports facility is being used for competitive use, it’s worth doing some research or making it apparent that it’s being used for competitive usage as if the facility is for example a tennis court, which is a regular product to be made out of macadam surfacing, will have to fit the criteria set by the ITF to be used competitively or professionally. 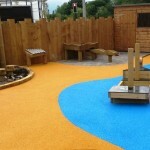 However if you are a leisure centre or school that will be using the facility primarily for just recreational usage, then the size of the facility does not have to fit within any specification, allowing for savings due to there being less materials used to create the surface. Please feel free to speak to our team if you would like more information on the different products we offer and the designs for each one. Simply fill in the contact box to let us know what you need and we’ll get back to you as soon as possible. The sizing for macadam surfaces will vary from institution to institution, for example, a school with lots of students will need a bigger sports facility than a school with only a small amount of pupils. 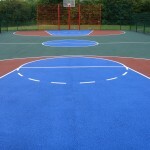 Also the sizing for macadam surfaces will vary for leisure centres, as obviously the bigger the surface the more people can use it, the surface could accommodate five or six 5-a-side courts whereas a smaller on could only handle four, this allows for more return on investment through renting the surface out. However with the sizing for macadam surfaces increases the prices for maintenance, cleaning and the fencing around the perimeter (if you choose to install it) will also cost more due to the increase in materials required. The sizing for macadam surface will vary for different institutions, and we will give you the freedom to create the perfect sports surface.